The 5390 kit has a Vsionis EL100-FSE normally open eletric strike lock made from stainless steel that provides 1100lbs of reinforcement plus a power supply. This model can be used on wood, metal, and PVC doors. 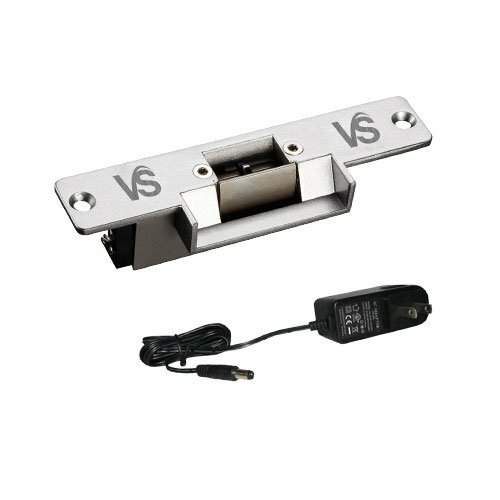 Whether it is for a simple or advanced access control system, this strike suits multiple security needs and is reliable. The strike is installed within your door frame and used to secure your door for your access purposes. Electric strikes are great for doors, small enclosures or any area door you would like to give added security to at any time. This particular electric strike is fail secure; meaning that in the case of a power outage, the latch will engage and the door will become locked. The power supply provided will allow you to hook it up right away. This kit has a 3 year warranty with full access to tech support in the USA! If you have any questions about this product by Visionis, contact us by completing and submitting the form below. If you are looking for a specif part number, please include it with your message.